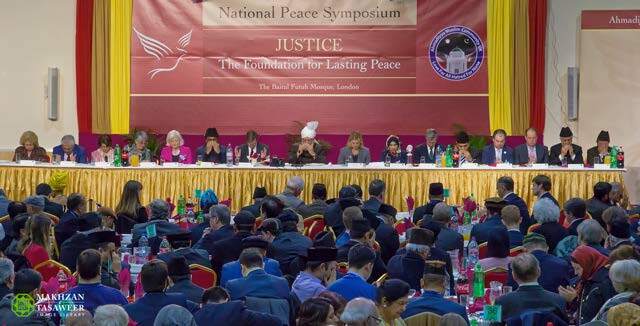 On 19 March 2016, the World Head of the Ahmadiyya Muslim Community, the Fifth Khalifa(Caliph), His Holiness, Hazrat Mirza Masroor Ahmad delivered the keynote address at the 13th National Peace Symposium hosted by the Ahmadiyya Muslim Community UK. 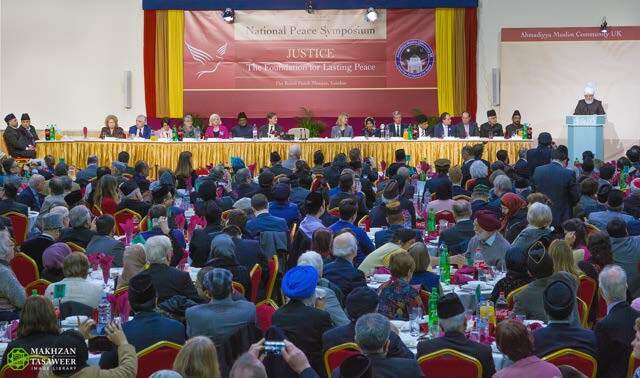 The event was held at the Baitul Futuh Mosque in London with an audience of more than 900 people, from 26 countries, including over 500 non-Ahmadi guests comprising Government Ministers, Ambassadors of State, Members of both Houses of Parliament and various other dignitaries and guests. His Holiness also presented Ms Hadeel Qassim, with the Ahmadiyya Muslim Prize for the Advancement of Peace in recognition of her outstanding efforts to personally alleviate the suffering of thousands of refugee children stranded in dangerous and inhospitable camps in the Middle East. During his address, His Holiness spoke of the fundamental need for justice and equity at all levels of society in order for genuine and long-lasting peace to be established. who were perpetrating mass cruelties falsely in the name of Islam. 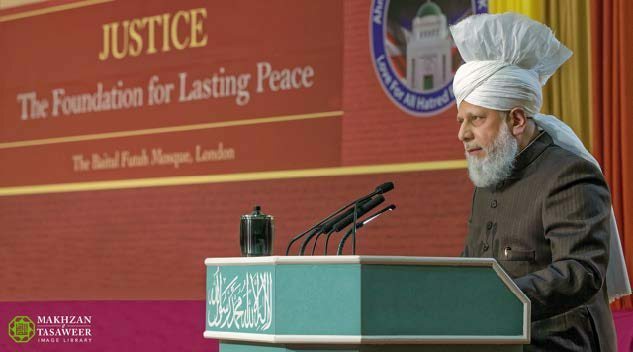 His Holiness also stated that there was no punishment for apostasy in Islam and that the Holy Quran was the standard-bearer for universal religious freedom. His Holiness reiterated the need to cut the supply lines and funding of all terrorist and extremist groups worldwide. During a press conference held prior to the Peace Symposium, His Holiness expressed his view that the United Kingdom should remain part of the European Union. He expressed his hope that the ‘Remain’ campaign would prove successful and that there would be no ‘Brexit’ from the European Union. 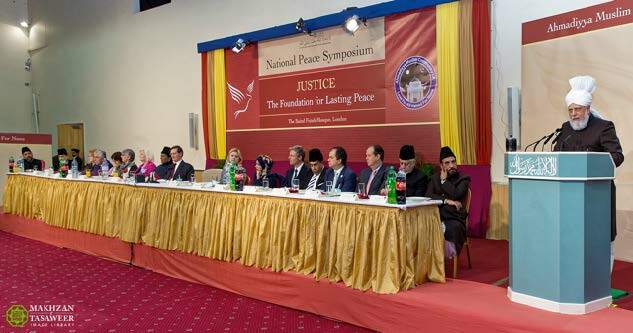 Hazrat Mirza Masroor Ahmad began his keynote address by reflecting upon the fact that modern day terrorism and extremism had caused a fear of Islam to spread far and wide. 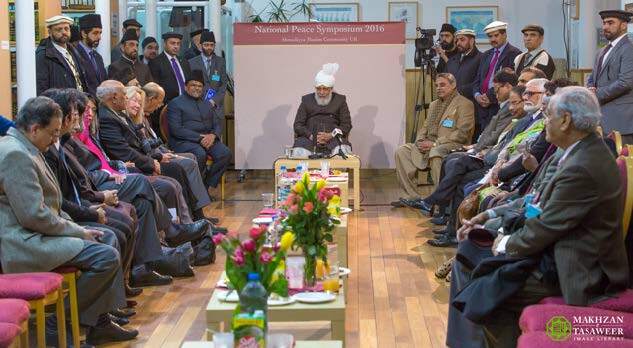 Nonetheless, His Holiness made it clear that true Islam was a religion of peace and that the brutal acts being committed by certain so-called Muslim groups were not permitted or justified by Islam in any way. Where cruelty and injustice prevailed, His Holiness said that Islam advocated two methods in order to bring about peace and reformation. 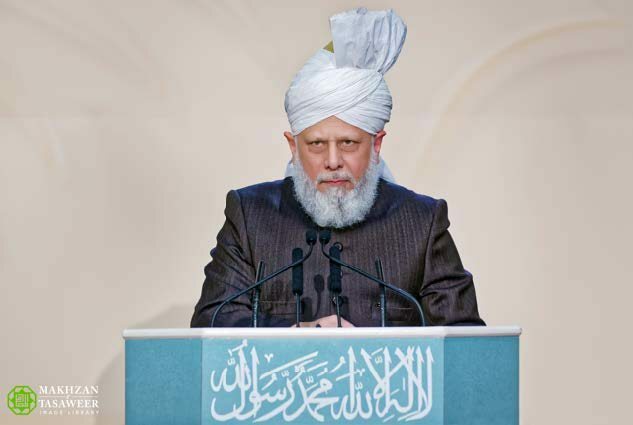 Refuting a common allegation levelled at Islam, His Holiness stated that there was no punishment for apostasy in Islam and that universal religious freedom was a core Islamic principle. 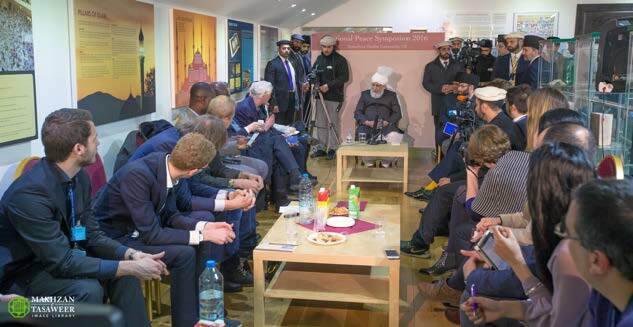 His Holiness said that the media did not waste any time in associating the brutal acts of terror committed by so-called Muslims to the teachings of Islam, whilst they ignored the voices of those who were earnestly striving to spread Islam’s true peaceful teachings. with the Syrian Government in order to alleviate the desperate plight of the Syrian people. His Holiness said that world governments or international organisations should prioritise peace over and beyond a desire for regime change. He said they should learn from the tragic examples of Iraq and Libya, wherein both countries had been mired in conflict and lawlessness ever since their long-standing leaders were forcibly removed. Whilst His Holiness warned that there was a real risk of another world war he also stated that there was still time to avert such a catastrophe – if all parties were willing to act with justice and set aside their vested interests. His Holiness criticised the continuing failure to cut off the financial supply lines of terrorist groups and the fact that certain powerful nations, who claimed to be working for peace, were exporting weapons to the Middle East that in turn were fuelling wars taking place in Syria, Iraq and Yemen. Both before and after the proceedings, His Holiness met personally with various dignitaries and guests also held a press conference with members of media.